When I visited Morocco recently, I took lots of products away with me with the intention of trying them out and using them up. You know me by now- I don’t like to take products away with me that I’m going to end up having to bring back or leaving their half full as I think that it is a complete waste of money. I like to take things away with me that I’ll fully use up while I’m there so that I’m bringing the very minimum home back home with me. With that in mind, I’m sure you’ll not be surprised to find out that I have lots of empties to share with you. The first product that I used up was the Ladival Sun Protection Spray SPF 50+ which was absolutely brilliant to use. My friend used this from day one and didn’t burn at all whereas I used the SPF 50 Ambre Solaire product below and unfortunately, burnt, despite reapplying it very frequently and popping in and out of the shade. Mid way through the holiday I started using this spray and never looked back. It leaves the skin feeling hydrated and well protected. The spray is fantastic as it dispenses just the right amount of product and rubs in quickly, without leaving a white cast on the skin. I would absolutely buy this again. The next product that I used up was the Boots Mediterranean Olive, Wheatgerm & Honey Body Butter which I don’t think is even available anymore! This was a lovely body butter, very moisturising without being too heavy on the skin and it sunk in relatively quickly leaving my skin feeling soft and smooth. The scent wasn’t really to my taste but it was very light which is ideal for hot climates as it doesn’t attract the mosquitos quite so easily! There are plenty more body butters available here. I’ll not be buying body butter for a long time as I have enough body moisturisers in my stash to open a shop! Next up is an absolute holiday essential for me and thats the Soltan Head and Hair Invisible Spray which is an SPF to spray on your head. It has an SPF of 30 and does a great job at protecting my scalp from getting burnt in the sun. For years, my scalp would burn and peel but since starting to use this a couple of years ago, I’ve never had that problem. LOVE IT! Next up is the Riemann P20 Once A Day Spray in SPF 15. While I would never just apply my sunscreen once, I do really like this product because it is clear and dries onto the skin very quickly so you’re never left feeling tacky or sticky. I used this when we were going on day trips in Morocco because it didn’t stain or leave white marks on my clothes. I’d definitely repurchase it again. Moving onto another SPF and this time it is a little bottle of the Malibu SPF 20 Lotion which I got for free with a little aftersun when I placed an order for a few things online. This is a nice sun lotion in that it rubs in well, has a nice smell and doesn’t leave too much of a white cast but for me, I wouldn’t repurchase it. I do like Malibu products but I prefer their oil in the spray bottle as it is more convenient for me to use, so I would definitely buy something from Malibu again, just not the lotion. 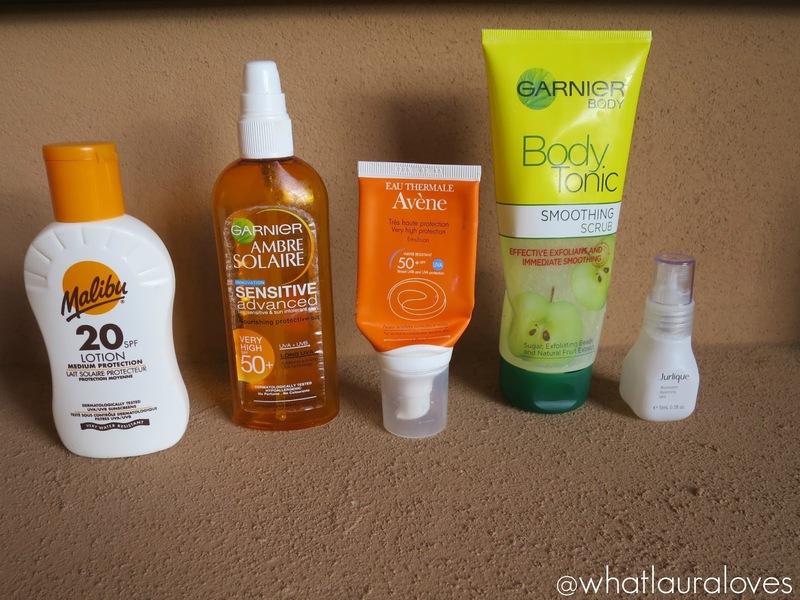 Next up is the Garnier Ambre Solaire Nourishing Protective Oil in SPF 50. I used this for the first part of my holiday and I have to say that I wouldn’t recommend it. I always use oils when I go on holiday as I find that they keep my skin moist whereas this one didn’t. It didn’t leave an oily residue either, it just seemed to dry. While I can’t say for certain if it was because of this oil, what I can say is that I reapplied it very frequently on the first day of the holiday and I burnt quite badly and for that reason, I wouldn’t buy it again. Then there’s the Avene Facial SPF 50 which has been keeping my face burn free for years. I first reviewed it in this post here and I have been repurchasing it ever since. This is a fabulous SPF for the face as it absorbs quickly, doesn’t sting your eyes if you sweat in the hot sun and it doesn’t clog your pores, causing breakouts, etc. I absolutely love this product and would highly recommend it! Moving onto the shower where I used up the Garnier Body Tonic Smoothing Scrub which has a really awakening citrus scent. It is really effective yet gentle on the skin at the same time which makes it really good to use on a daily basis, if needed, which is why I chose to take it on holiday with me as I find that exfoliating daily helps to bring out my tan and keep my skin looking and feeling smooth. I would definitely take one of these on holiday with me again but for now, I’ll be repurchasing my favourite body scrub from Soap and Glory. You can read a full review of the Garnier Body Tonic scrub and 3 others in this post. Lastly, I finished up a deluxe sample size of the Jurlique Rosewater Balancing Mist that I received in one of those amazing goodie bags that Space NK do a couple of times a year. This mist is a toner that you spritz onto your skin after cleansing. It refreshes and prepares the skin for the moisturiser that you’ll be putting on afterwards and smells delicately of rose. I wouldn’t buy the full size of this because I didn’t notice too many skincare benefits after using it all up. I would say that it is great as a refreshing yet relaxing step in my routine but certainly not an essential and there are more effective toning products out there. 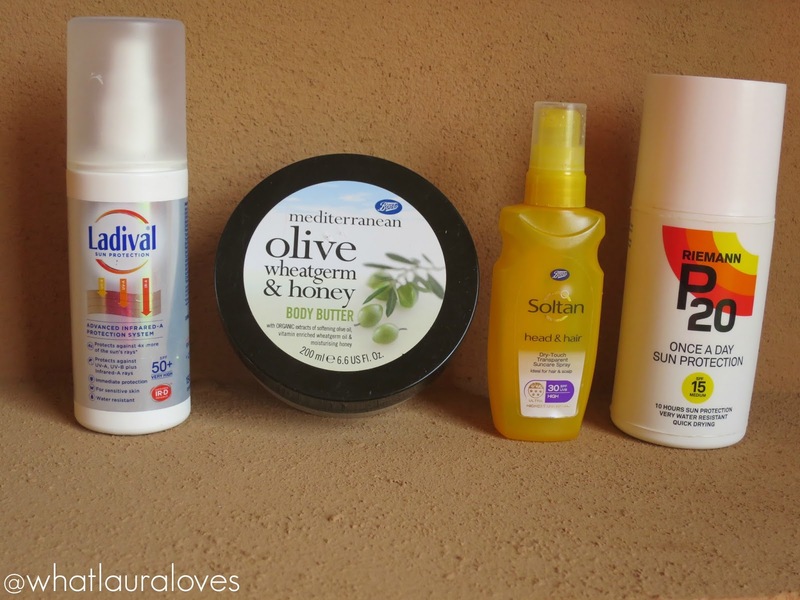 I’ll be posting my second Moroccan Holiday Empties post very soon so check back to my blog for that! That head and hair sunscreen spray sounds great! I had no idea there was a product like that – need to get that for my kids! !